Nothing like wool eggs to warm your wristies! Really, everyone needs a pair, if I do say so myself, and this is now possible because I am providing the pattern below. Enjoy! * Pattern is worked in the round. Each round begins with a ch 1 and ends with a sl st in beginning sc to join. 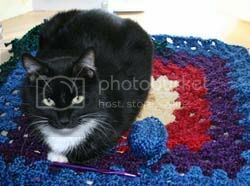 * Basic ribbed pattern requires work to be turned after the completion of each round. Rep rnds 3 and 4 until your cuff fits snug around your wrist, yet still able to slide over your hand (I worked mine until I had 18 ribs completed). Fasten off. Working one cuff "tube" at a time, pin ends of cuff tube together and sc around entire pinned tube to close opening. Weave in ends and flatten out joined tube to wear as a cuff. *Pattern is worked in the round. Each round begins with a ch 1 and ends with a sl st in beginning sc to join. * For rnd 8 use a combination of stitches (sc, hdc and dc) at random to create an uneven edge. I suggest building curves. Working up a curve by using sc first, then hdc and finally, dc for the apex. Diminish the curve by using dc first, then hdc, finishing it off with sc. Working one egg/cuff combination at a time, place a bit of fiberfil in the concave side of the yellow portion (yolk) of the egg. Pin egg to cuff and tack down cream portion of egg (closest to yolk) using a length of leftover cream yarn. It is preferable to only sew through egg and first layer of cuff. Weave in any ends. Repeat process for remaining cuff and egg combo. Slip embryos on your wrists and enjoy! 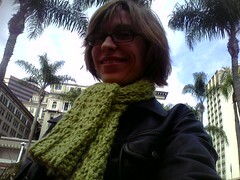 and i still have your xmas gift! Faboo, of course! 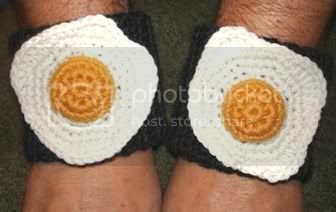 Why didn't I think of egg cuffs? 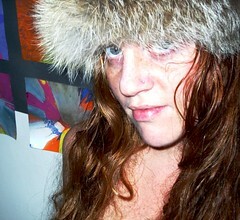 Yeah, the quirk-factor is kickin' in allright. You are lucky to find a hairy-armed man to model your cuffs! Years (and years) ago, I had a 60-ish co-worker who loved to flash her ta-ta's at our male colleagues. They always said her's looked like fried eggs. Your eggs are much (much!) nicer. Thanks for the memory and the laughter. Hmmm, as tempting as it would be to make these into pasties, I'm thinking perhaps incorporating the egg motif into a skillet hat... Awesome pattern!! Thanks for posting it! I think the pasties application an excellent idea. Love the Egg-warmers. Very cute! I can so see this as a headband. With a) bacon on the band or b) bacon for the band. I love these eggs so much !!!! Am I travelling in Alice's Wonderland ?! I can totally see these on a Victoria Secret runway with bacon bottoms. Great idea! 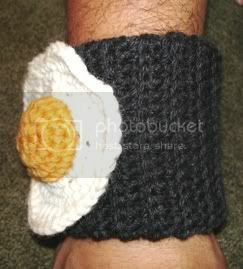 Hehehe, you can make egg cuffs and wear them with the chicken beanie! 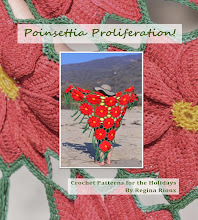 Thanks for the pattern, and publish a book soon so I can buy many copies for myself and all my friends! Regina!!! 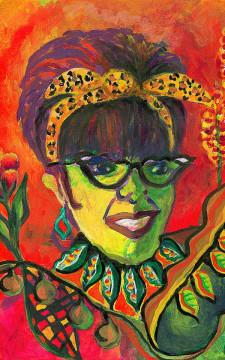 Did you see Thursday's Uncommon Threads? They showed your bacon wrap, mixed grill wrap and the link scarf!! Yay!! (Im just now getting thru the Tivo stuff from last week). That actually makes me really hungry for fried eggs. Are we having an obsession with poultry lately? Just curious. Nothing wrong with that. Everybody has to be obsessed with something. Too cute! They go great with the Chicken Beanie! Okay- now that you've made the bacon shawl, and the fried egg wrist warmers, now you need to make ear muffs that look like english muffins...decoratively edged with grape jelly. Hilarious!!! 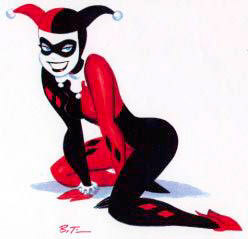 Audacious and downright cheeky! Love it!!!!! Many thanks for this pattern ! I'll try in this afternoon ! it's so cute ! I love it !